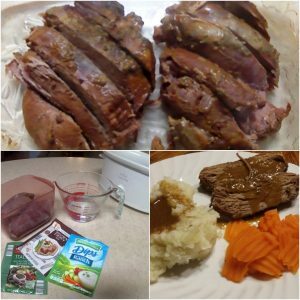 Place venison roast into greased slow cooker. Stir ranch mix, Italian mix and gravy mix into water until dissolved. Pour mixture over venison (the roast needs to be completely covered with liquid, add more water if necessary). Combine cornstarch and ¼ cup water to make a slurry. Heat slurry in saucepan with 1 cup liquid from Crock-Pot until thickened. 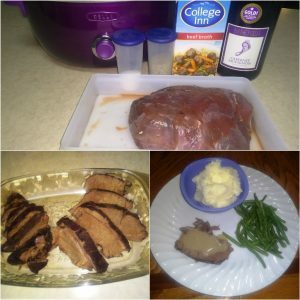 Serve sauce over sliced venison roast. This recipe was inspired by Flavorful Pot Roast Recipe, click here for that recipe. Sauté the onion and garlic in canola oil. Heat the cup of water in microwave; stir in tomato paste to dissolve. Combine onions, garlic, tomato water, mustard, vinegar, brown sugar, chili powder and cumin in slow cooker; stir together thoroughly. Add venison and bacon to slow cooker. 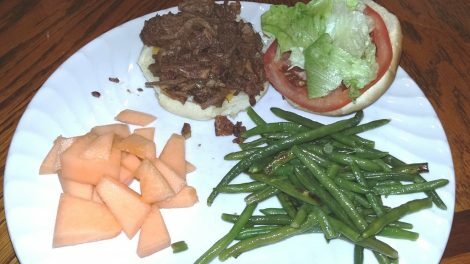 This recipe was inspired by Slow Cooker Venison Sloppy Joes, click here for that recipe. Open the can of baked beans and pour some of the liquid into the bottom of a large baking dish. Combine venison, breadcrumbs, eggs, milk, ketchup, Worcestershire, mustard, and brown sugar thoroughly. Form meatloaf mixture into eight mini-meatloaves and place into prepared baking dish. Top each mini-meatloaf with some onion and garlic. 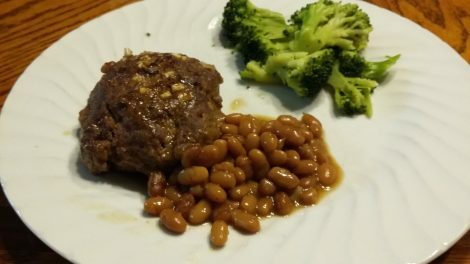 Pour baked beans from can around mini-meatloaves in prepared baking dish. Bake at 400 degrees for 30 – 40 minutes or until each meatloaf is cooked through. Place diced carrots and potatoes into slow cooker. Dust cubed venison with flour. In a skillet, brown venison in canola oil; add venison to slow cooker. Sauté onions and garlic in skillet; add onions and garlic to slow cooker. Add beef base, Worcestershire, thyme, bay leaves and pepper to slow cooker. Add water to slow cooker until it just barely covers the other ingredients. Cook on low for eight to ten hours. Taste before serving, add salt and pepper if desired. Sprinkle venison roast with salt and pepper. 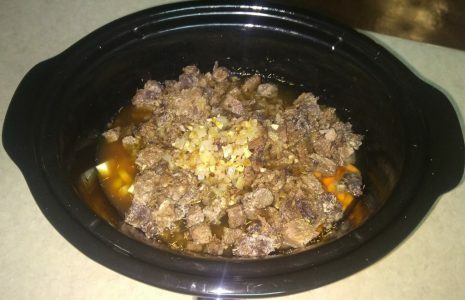 Place venison into greased slow cooker. Pour beef broth and red wine over venison (the roast needs to be completely covered with liquid, add more broth or water if necessary). Mix together beer, sliced onion, lemon juice, and Worcestershire sauce. Sprinkle tenderizer and pepper on venison. Marinate venison for 5 – 9 hours in refrigerator. Remove venison from marinade and drain (to allow for a good sear). Sear venison over medium-high heat in skillet. Place venison in 350 degree oven to finish cooking to desired doneness (mine took 20 minutes for medium to medium well). Let venison rest for 10 minutes before slicing into 1” pieces against the grain. Whisk together the eggs, milk, salt and pepper in a large bowl until it looks slightly fluffy. Add eggs to nonstick pan and continue stirring until they are cooked through. Place potatoes in 13×9 inch greased pan. Sprinkle potatoes with no-salt seasoning (like Mrs. Dash). Cook in 350 degree oven for 45 minutes or until done. Place potatoes on plate, sprinkle potatoes with shredded cheese and top with sliced venison. Sprinkle taco seasoning evenly over cubed venison loin. 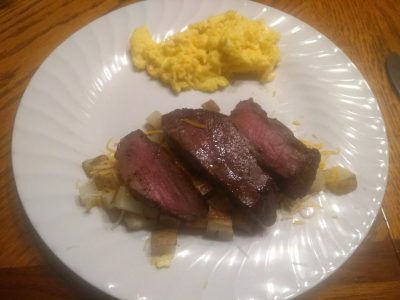 Cook cubed venison loin in skillet with olive oil until done. Add mango peach salsa to skillet. Simmer over low heat approximately 15 minutes to let flavors combine. Seal the loin in a vacuum bag (a zipper bag will work too, just try and get as much air out as possible). Place the loin in the cooler of hot water and close the lid. Let it soak at least 2 hrs, but there is no harm in letting it go longer, as the temperature of the water will not let it overcook. My loin cooked for 4 hours. Monitor the temperature using a remote thermometer placed in the water, adding heated water as necessary. Sear either over high direct heat on a grill or in a very hot, heavy skillet with some butter. After the meat is seared, remove from the heat and loosely cover with foil and let it rest for 10-15 minutes. Once the meat has rested, slice it and serve along with your favorite side dishes. Note on cooking method: Sous vide is a French term meaning “under vacuum”. The meat is cooked in a vacuum sealed bag using a temperature controlled water bath, then seared either on the grill or in a skillet. The beauty of this method is the ability to control the final temperature of the meat and evenly cook the meat all the way through. Cooking sous vide is commonplace at high end restaurants with high dollar equipment. However, it can be done at home with a simple cooler, some hot water and a remote thermometer. 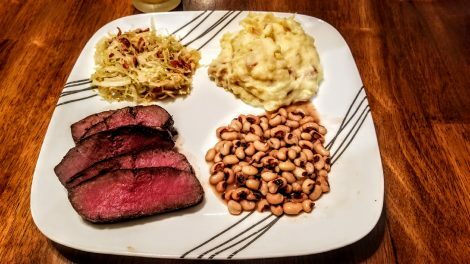 This recipe is compliments of Brandon Pittman, a GrowingDeer Pro Staffer. Warning: This post contains information about sous vide cooking. The USDA recommends cooking raw meat to an internal temperature of at least 145 F as measured with a food thermometer before removing meat from the heat source AND allowing meat to rest for at least three minutes before consuming. Coarsely chop the celery, carrots and onion; place in a food processor with garlic. Cover and process until finely chopped (yields 1 cup of processed veggie mixture). Sauté veggies in canola oil. Add in venison and cook until meat is no longer pink. Stir in salt, cloves, mace, no-salt seasoning and beef broth. Cook over low heat 20 minutes. Stir in breadcrumbs (this should absorb any excess moisture that has not evaporated; if there is excess moisture add more breadcrumbs as necessary). Line a 9-inch pie plate with one pie crust for the bottom crust. Fill pastry with meat filling. Place second pie crust over filling for top crust, trim and seal around edges as necessary, cut slits in pastry. Bake at 350° for 50-60 minutes or until pie crust is golden brown. This recipe was inspired by French Canadian Tourtieres, click here for that recipe. 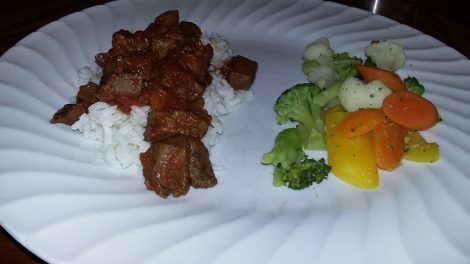 Sprinkle venison stew meat with tenderizer; refrigerate 30 minutes. In a skillet, brown onions in oil. 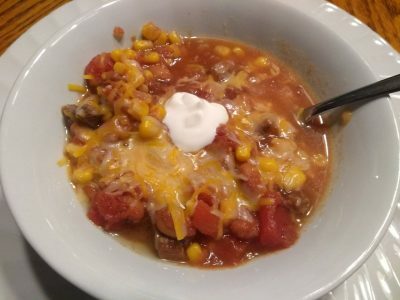 Combine tomatoes, corn, beans, cumin, garlic powder and pepper in slow cooker. Stir in sautéed onions and venison combine thoroughly. Cook on low for six hours or more. Taste before serving, add salt only if necessary (meat tenderizer contains salt). Serve in bowls with shredded cheese and salsa.